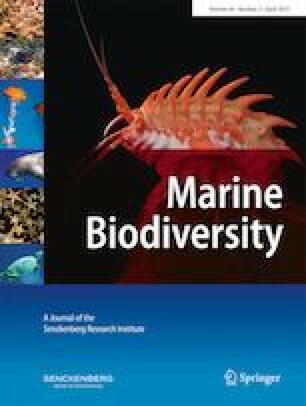 Combined morphological and molecular genetic analyses confirmed the occurrence of the stalked jellyfish Haliclystus tenuis Kishinouye, 1910 on the coast of the island Helgoland (North Sea, German Bight). The species was previously reported in Japan and China only, and it was assumed that its geographical range is limited to the northwest Pacific. Possibly, the species was overlooked in Atlantic waters because of its morphological similarity with the Atlantic species Haliclystus octoradiatus Clark, 1863. However, the low intra-specific variation in mitochondrial gene cytochrome c oxidase subunit I (COI) does not indicate a geographic separation of Atlantic and Pacific specimens and may indicate a non-native introduction. We thank Karen Jeskulke for her assistance in sampling and laboratory work. We gratefully appreciate the scientific guest research service provided by the Biological Institute Helgoland (BAH, Alfred Wegener Institute, Helmholtz Centre for Polar and Marine Science). We thank two anonymous reviewers for their comments improving the manuscript. This is publication number 52 from the Senckenberg am Meer Metabarcoding and Molecular Laboratory. This study was funded by the Federal Ministry of Education and Research of Germany (BMBF Grant No. 03F0499A and 03F0664A) and the Land Niedersachsen.